This is effectively the smallest standard gauge production loco type used in industry in this country. At only 48 horse power and with simple driver controls, this locomotive was supplied to small factory operators who only needed to shunt one or two wagons on an occasional basis. Our example is a robust and sturdy example, well preserved by the Army Transport Museum and displayed at their Beverley site until this was wound up in 2005. 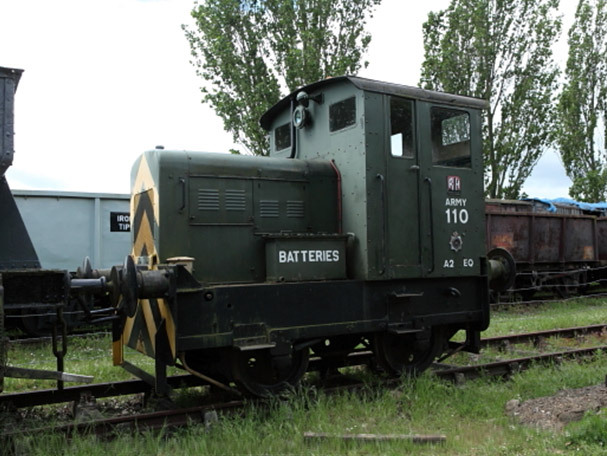 The Museum were pleased to donate it to our collection and it has joined our operational fleet as a prime and valued example of this small and locally produced shunter. We have used the loco for its intended use and it regularly took charge of the tool van and compressor with the platelayer gangs on track work. The loco is currently on loan to our friends at the Waverley Route Heritage Trust based at Whitrope close to the borders. The loco was the first locomotive to run on the relayed Waverley mainline in mid-2011. We look forward to its return after its northern journeys in due course!